Federal Reserve Chairman Jerome Powell has said the central bank can afford to be patient on further rate increases. The economy is growing at a "solid rate" and inflation is hovering near the Federal Reserve's target, the central bank said Wednesday. As expected, the Fed did not raise its key interest rate. But in a reversal from December, the Fed said it will be "patient" as it decides when to change them again. The announcement came at the end of a scheduled two-day meeting, the first of the new year. The Fed's closely watched decisions can affect interest rates on everything from credit cards to mortgages, as well as the rates banks pay savers. In their statement, Fed policymakers said the labor market has continued to strengthen, "economic activity has been rising at a solid rate" and spending by households "has continued to grow strongly." 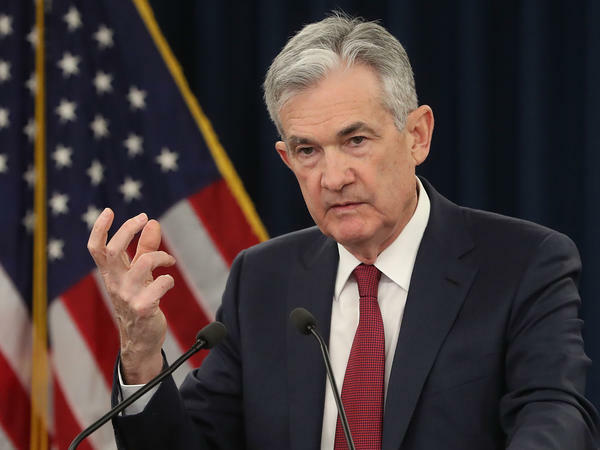 "In light of global economic and financial developments and muted inflation pressures, [the Fed's policy committee] will be patient as it determines what future adjustments to the target range for the federal funds rate may be appropriate," the Fed said. Powell has said that, with inflation "low and under control," at around the Fed's target of 2 percent, policymakers can take their time before raising rates. "You should anticipate that we're going to be patient and watching," Powell said in an appearance at the Economic Club of Washington, D.C., earlier this month. The Fed's statement Wednesday, saying policymakers "will be patient," echoed those remarks. It marked a reversal from December, when the Fed signaled that "some further gradual increases" were coming. President Trump has frequently bashed the Fed for raising rates and hurting economic growth — raising concerns that the president's attacks threaten the central bank's independence. On Wednesday, major stock indexes rallied after the Fed's announcement. The Dow ended the day up 434 points, or about 1.8 percent; it had been up about 250 points shortly before the Fed released its decision. NPR's Uri Berliner contributed to this report.